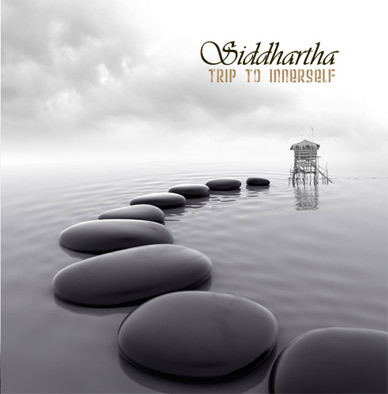 Siddhartha - "Trip To Innerself"
This album was actually recorded over ten years ago, and I don't know what these Turkish people have been up to since then, but this is seventy-five minutes of pretty generic pseudo-prog/heavy-rock (not that the tunes are "truly heavy", it's just that style), and despite the package's frequent references to "psychedelia", the psyche/space-rock side of things remains pretty light throughout. They're solid rock musicians and I'm sure they enjoyed recording this, but it just sounds so hackneyed. The keyboards and little synth-runs are a quiet, steady background neo-prog-metal style that don't build any interesting atmospherics. The band gets a pretty heavy jam going towards the end of the instrumental title-track, and then a cool meltdown to close, but it's not worth the preceding ten minutes of blandness. On "The Explorer" I'm reminded of Wall-era Pink Floyd, which thanks to commercial, classic-rock radio-programming has assumed a somewhat lame connotation throughout much of the Western World. It perked my ears up later with a nifty eastern-styled bass riff which generally I respond to, and later the guitar-lead plays along, but again it's futile in the context of the overall staleness of their sound. Most of the vocals here are a melodic, generic-sounding European-inflected whine. "Desert" is a somber tiring folk tune which doesn't make an individual statement. The lengthy "Nervous Breakdown" seems to stretch into some interesting dynamics, then there's some cheesy maniacal screaming, then it cuts back to some slow guitar, a whiny vocal and very cliche sounding commercial metal lead-licks. "Beyond Destiny" is about the same but over more of a blues, later there's some pretty adept lead guitar. You can tell from "Distant Cry" that these guys want to establish an ethereal vibe, and I notice the leadwork here is tuned liked Gilmore's Floyd sound ala "One Of These Days". Ach, but again, these keyboards, the vox, the piano are just not happening! Let's listen to the closer "Black" again... a guest female vocal (maybe she ought to have sung the whole album! ),.a slow doomier beat, some wah-lead, chants, breathy orchestral keyboards, kinda cool piano-lead, the organ-ish keys build, some spoken word... fade... a little different but...I'm fading. Sorry guys.